I care very much about what I do! I take it very seriously and I expect that you will too. Therefore, I do not, and can not provide a $10 or $20 piercing. I do not tattoo for under $65. This is an industry that should be taken seriously. The people working in the body art industry, are providing a service that can have serious consequences! There are additional costs associated with performing this business the best way we can to protect your health. Ignorance doesn’t protect you. A bacterial infection or a life threatening virus doesn’t say “Oh, you’re ignorant and don’t know how I can affect you, therefore I’ll leave you alone and not infect you.” It doesn’t work that way! Not knowing or thinking you know it all and don’t…doesn’t protect you! You want to live a good life with low risk complications….please do your research before committing to something that can have serious lifelong or life threatening complications. Always choose an educated, experienced, PROFESSIONAL tattooist and body piercer! Even if it’s not Dynamic Piercing & Tattoo! Never get tattooed or pierced in someone’s home or in some sketch joint that doesn’t require ID’s, or does things on the down low. If they don’t care about doing it the right way, they don’t care about your health either!! You have the right to ask any body artist or studio about their certification and inspections. You also have the right to ask as many questions as you want. Ask to see the studio. Ask to see the sterilized packages. Check to be sure those packages are processed. There are indicators on the sterilization packages that show whether an item has been sterilized or not. You can also ask whether they sterilize or simply disinfect. Everything we use is sterilized in an onsite autoclave! Except for our needles, which are ordered pre-sterilized and only used one time and then disposed of in a biohazard needle box and picked up by our contracted biohazard disposal company. This includes both piercing and tattoo needles. The health department regulation for Colorado states that only the needles have to be sterilized. Jewelry, forceps, hemostats, tattoo tubes, and the like, simply have to be disinfected. Dynamic Piercing & Tattoo deems that unacceptable and inappropriate. The difference between disinfection and sterilization is that disinfecting only kills some germs. Sterilizing is the only way to destroy all spores. Therefore, all of my instruments that can be reused such as forceps and hemostats are first washed and disinfected. Then they are rinsed, packaged and sterilized before ever touching another client. All jewelry to be used for initial piercings is sterilized as well. Every sterilized load is dated and logged. 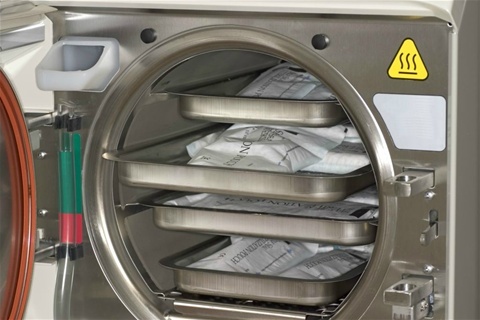 Our sterilizer is monitored regularly to assure it is functioning properly.